This picture of Ratu Epeli Nailatikau (left), Ratu Epeli Ganilau (centre) with Fiji's dictator, Frank Bainimarama (right), says it all - including the common lack of integrity and honour in these three men. In 1999, Ratu Epeli Ganilau appointed Bainimarama, a naval captain, as Commander RFMF above more highly qualified and more experienced senior military officers. Ratu Epeli Ganilau had also been appointed Commander RFMF in a similar way, above more senior and more highly experienced and qualified military officers. Ratu Epeli Ganilau stood in the May 1999 elections and lost. The indigenous Fijians had been split during that election year, enabling the mainly Indo-Fijian backed Labour Party to secure a landslide victory. The 1997 Constitution worked. The Fiji Labour party president, Mahendra Chaudhry, seeing the scale of victory, bamboozled his way into the PM’s office and, among other things, started to pick at the native lands. On 19 May 2000, Bainimarama ordered his elite military forces, the CRW, into parliament with George Speight to overthrow the democratically elected government in a coup and hold them hostage. Ratu Epeli Nailatikau, was to join Speight in parliament and take over the running of government. The President Ratu Sir KKT Mara consulted his son Ratu Captain Tevita Mara, who advised him that the standard thing to do in such a situation was for the army to cordon off the entire parliament complex and not let anyone in or out. Also, all communication into and out of the parliament complex was to be restricted. The President then called on the acting head of the RFMF for advice, the advice the President received was to do nothing. The President disagreed and stood his ground against Speight and his supporters. Senior army officers also stood their ground, which stopped the bulk of the army from backing Speight and his supporters. Bainimarama, however, on his return from Norway, told the senior officers that the RFMF was supporting Speight. Not all officers went along with it. A senior Colonel also challenged Bainimarama’s decision in front of other officers, and Bainimarama backed down. Bainimarama then tried to build support from within the lower ranks by telling the rest of the CRW boys that they could take leave and go and join their comrades at the parliament complex. A number of them went because of the strong bond they shared as a unit, but they later realised that they had been tricked and were being used. Captain Steven (CRW), who had just returned from a training exercise, ordered his men not to go to the parliament complex. His men followed his orders and did the right thing. But a few army officers moved freely between the parliament complex and the army camp at Nabua - under orders from Bainimarama. A number of them stated later that they were confused as to which side the army was supporting. There was no clear leadership from the camp – and from the Commander Bainimarama. Without key support from the bulk of the officers and the army the coup was doomed and Ratu Epeli Nailatikau was forced to back-down and abandon Speight. Speight was left to his own devices to deal with the situation. CRW soldiers who had gone into parliament under Bainimarama’s orders all said later that they were waiting for Ratu Epeli Nailatikau to join them. He never did. Ratu Epeli’s wife, Adi Koila, was also being held hostage in parliament. Days later Bainimarama, in his second coup in 2000, overthrew his Commander in Chief of the RFMF and President of Fiji, Ratu Sir KKT Mara and declared martial law and placed Mr Qarase at the head of the interim government. The 2000 coup had failed so Bainimarama, while trying to appear innocent, had to find a way out for himself. He chose to divert all blame on to his CRW men whom he had ordered into parliament. 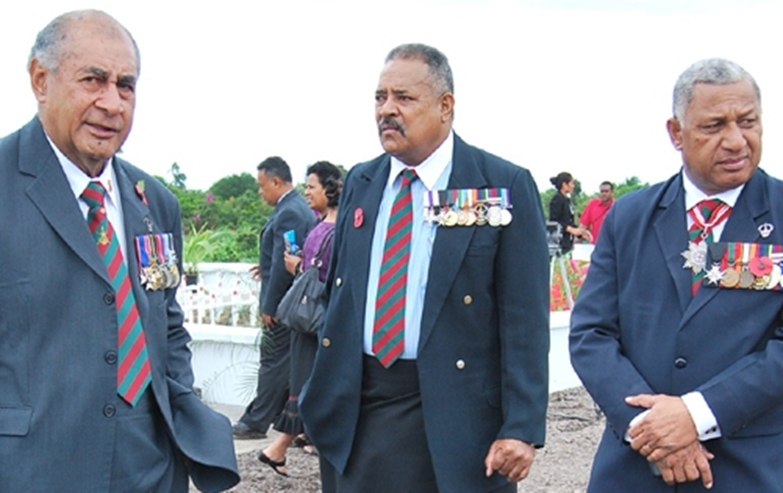 The CRW soldiers became Bainimarama's scapegoats. Ratu Silatolu, in a letter he wrote from prison to Bainimarama, referred to the CRW as Bainimarama’s sacrificial lambs. Bainimarama, had hid cowardly behind his CRW soldiers and then had them arrested, beaten and tortured by the unwitting army who were clueless as to Bainimarama’s involvement in the 2000 coup. Col Tarakinikini stated in his affidavit that Bainimarma wanted it all – to rule Fiji. The CRW were then imprisoned while Bainimarama was hailed as Fiji's saviour. Bainimarama did not save Fiji in 2000. He was behind the 2000 coup. Now Ratu Epeli Nailatikau is President, albeit illegal, Ratu Epeli Ganilau was a Minister in the junta, and Bainimarama is ruling Fiji as dictator (and also running from the law for crimes including treason, murder, corruption, illegally removing the President of Fiji and sedition). Missing from the picture is the opportunistic, vindictive and evil megalomaniac Khaiyum, who now has control of Bainimarama’s strings. Khaiyum wormed his way into becoming Bainimarama’s puppet master and has the job of keeping Bainimarama out of prison and swimming in the spoils from their corruption. The interesting thing is that Bainimarama made it a point to be out of the country before the start of the 2000 coup, just as Ratu Epeli Nailatikau had done before the 1987 coup. Ratu Epeli had gone overseas during a time of unprecedented turmoil in Fiji, to receive a small naval boat donated by the Australians. Bainimarama on the other hand lied to his Commander in Chief, the President of Fiji, saying that all was well in Fiji and there was nothing to worry about. There was unrest in the country and the President told him so and also questioned Bainimarama's decision to travel. But Bainimarama insisted that all was well in Fiji -and then he left to attend a standard conference in Norway. The rest is history.